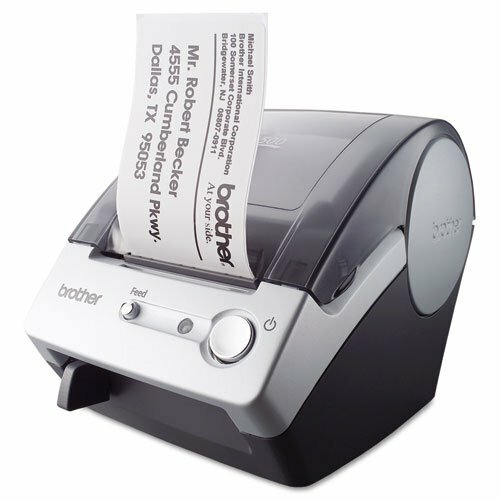 Brother - QL-500 Affordable Label Printer, 50 Labels/Min, 5-7/10w x 6d x 7-4/5h QL-500 (DMi EA by Brother at MDA-MA. MPN: QL-500 (DMi EA. Hurry! Limited time offer. Offer valid only while supplies last. Print cost-effective, professional labels for any general mailing, shipping and administrative applications with this economical printer. Print cost-effective, professional labels for any general mailing, shipping and administrative applications with this economical printer. User-friendly software lets you incorporate fonts, templates and graphics from your computer onto your label. Offers bar code and multi-label printing as well as mirror, vertical and rotated printing. Change labels in seconds, using drop-in rolls. 300 dpi resolution. Manual cutter. USB connectivity. Includes USB cable, label creation software and starter roll of standard address labels. Machine Width: 5 3/4"; Machine Depth: 6"; Machine Height: 7 7/8"; Power Source(s): AC Adapter (Sold Separately). Economical-perfect for small office/general office labeling. Offers bar code and multi-label printing as well as mirror, vertical and rotate printing. Uses convenient drop-in label rolls up to 2.4" wide.